The number of companies attending conferences, trade shows and other events is increasing with every passing year. They are on the lookout for new customers and partners who can give a competitive edge to their business. These businesses woo the target audience with a variety of giveaways to build and nurture relationships. 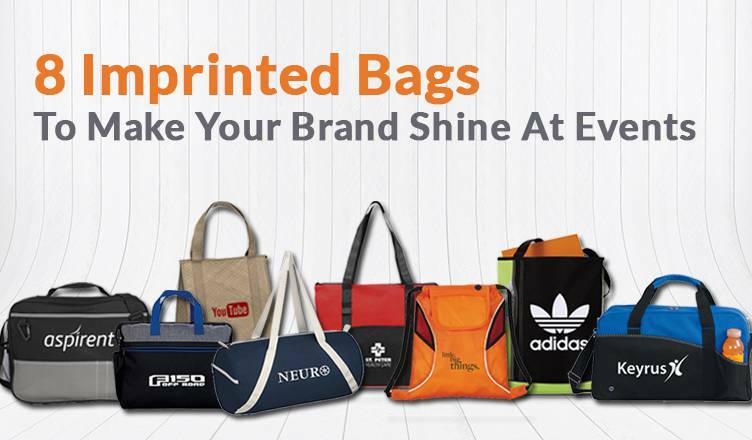 While there are plenty of categories available at Promo Direct to shop from, this article will focus on imprinted bags. Why bags, you ask? Well, they offer an impressive imprint area that will help people take note of your logo around town. They are also durable and will last for years after the event. 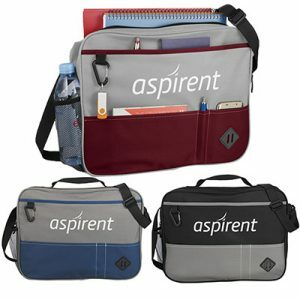 Featured below are 8 bags that are capable of showcasing your company’s credentials for the next event. 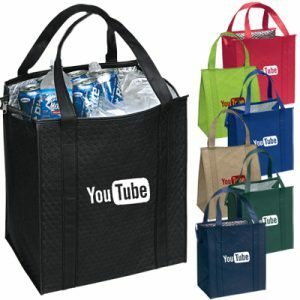 Choose one or more of these bags for maximum marketing impact. You should give away these bags only to those who show active interest in your offerings. 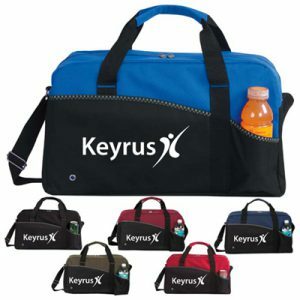 Count on our bags as efficient promotional items that can take your branding efforts to a whole new level. This product comes with our Free 24-Hour Rush Service, order today and we’ll ship tomorrow! It has a zippered main compartment, a huge front opening, lower card pockets, a pen pocket and a side water bottle pocket. An adjustable shoulder strap and a top grab handle are other highlights. 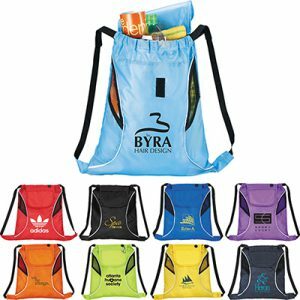 Made of 600d PolyCanvas, this bag will serve as the perfect addition to your next marketing campaign! The Stand Alone Briefcase features a padded laptop compartment that can house a 15″ laptop. It also has a zippered main compartment, a front zippered pocket and a side pocket. 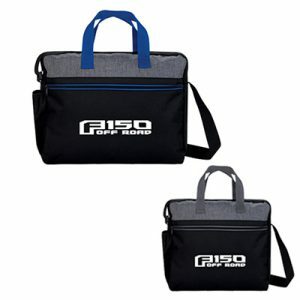 Made of 600D Polyester, this bag features an adjustable shoulder strap that ensures easy carrying around. The Therm-O-Tote is made from sturdy and premium non-woven polypropylene. It has a zippered closure, dual reinforced carrying handles, and a plastic bottom insert. It can efficiently store items in cool or warm conditions, keeping them fresh through the day. This compact tote will be a hit with acquaintances at events! This vertical-shaped tote bag features a huge main compartment and a front slip pocket. Made of 600D Polyester, this tote has a hook and loop closure. We suggest that you opt for this compact yet spacious bag today! 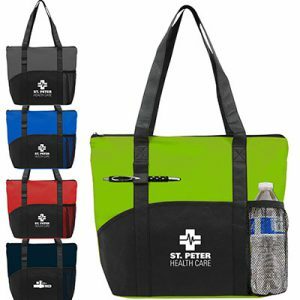 Made of non-woven polypropylene, this bag has 2 front slip pockets, a mesh pocket to hold a bottle, 2 pen loops and a zippered closure. It also has 26″ handles that offer a comfortable grip and easy carrying around. Sharing its name with the ever-popular Transformers character, this bag features a variety of pockets. It has a main compartment with a cinch top closure. It also has a media pocket, an earbud port and deluxe webbed backpack straps. 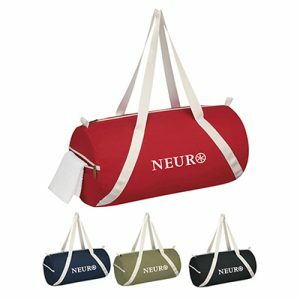 Duffel bags are highly recommended marketing giveaways. They can store more items than conventional bags. This bag is perfect for sports enthusiasts. It can house tennis gear and has fabric-wrapped handle grips. An adjustable shoulder strap, a front slip pocket and a water bottle pocket are other highlights. Made of cotton canvas, this duffel bag promises quality visibility around town! It has zippered main and side compartments to offer quality storage space. So, go ahead and choose the bag(s) of your choice. Get in touch with us if you have any queries regarding the bag to opt for. 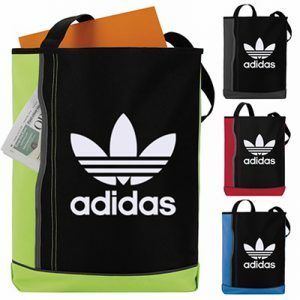 Also, you can visit our promotional bags section to view more choices. We can also offer useful marketing and business tips aimed at small businesses.